Let me be explicit on the front end. Nurse Kaci Hickox is a hero in my mind. She is the nurse all over the news who treated Ebola patients. You will see why she is in the news later. Honestly, any of these medical professionals from the West, that knowingly give up the comforts of home to go and treat Ebola in Africa are heroes in my book. They know as medical professionals full well the risk that they are taking, yet they do it anyway. As I stated in my article, Ebola: The Good, The Bad, and The Ugly, it will be people like this that we have to rely on should Ebola ever take hold in America. Namely, medical professionals willing to risk it all to save us. So I thank you Ms. Hickox. If you have been paying attention to the news lately, you will have noticed that New Jersey, New York, and potentially now Maine are looking to enforce mandatory quarantines on medical professionals returning from Africa whom have treated Ebola patients. 21 days seems to be the time frame that we are looking at here. If you make it past 21 days with no symptoms, the science tells us that all is well, you can come out and play. In walks hero Kaci Hickox. She is not a fan of this quarantine policy. She was most recently confined to a plastic quarantine tent in New Jersey. However, after much maligning and legal threats, she was finally allowed to return home to Maine. Maine consequently, asked her to remain at home for the 21 day incubation period to which she now states she will refuse to abide by the voluntary quarantine conditions to which I now dub her henceforth, The Most Selfish Hero You Will Ever Meet. Ms. Hickox and others seem to indicate that the science is on their side. To be honest, I don’t disagree. It would appear that Ebola is not easily transferred as you have to come into contact with the bodily fluids at a time when they are showing symptoms. This is great news! But let’s talk about bodily fluids. I was sitting in a doctor office one day many years ago, when an older gentleman walked past me. Normally I wouldn’t take notice, but this man you see was farting the entire time he was walking. He was doing a quick shuffle to the bathroom sounding like a go cart and I am pretty certain that before he entered the bathroom door we were entering “shart” territory. I am not going to explain the shart to you, but feel free to google it. Just don’t use google images. Anyone ever talked to a spitter? You know what I am talking about. Those people who seem to have the propensity to spit when they talk. In fact, I think we have all done it. You know the feeling when you are talking and you realize a little spit has hopped out on to your lip. You know its there, but if you wipe your lip with your hand or lick your lip, you might be busted. For it seems the best way to recover from that social slip up is to act like it didn’t happen. Anyone ever been spit on by a spitter! Lastly let’s discuss chunk. 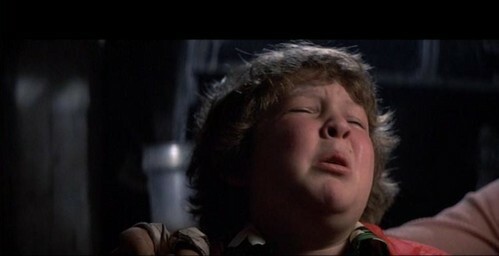 You and I know him as the lovable purveyor of the truffle shuffle from the movie Goonies. I remember the scene when he has been captured by the Fratelli gang and they are grilling him to talk. Eventually he confesses that one time he used fake throw up at a movie theatre that then caused someone else to actually throw that then led to a chain reaction of throwing up all over each other. Anyone ever smelled throw up that made them instantly want to throw up themselves? So hear is the thing Ms. Hickox, bodily fluids have a way of getting out beyond our control. It happens all the time. In fact, at my daughter’s swim lessons just this Monday, a kid threw up in the pool. It was gross. But be it puke, spit, sharts, or piss, sometimes when you gotta do it, you gotta do it. Whereas you seem to be a qualified hero, to be perfectly honest, I simply don’t know if you’re a spitter or not. 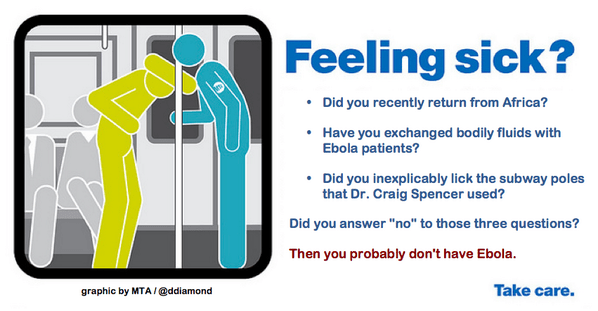 On twitter, this particular graphic was floating around trying to calm fears about the New York doctor who traveled on the subway having Ebola. The last line about whether you licked the pole was supposed to be sarcastic to which I would like to introduce you to my 2 year old daughter. Sarcasm ceases and reality begins because honestly, she just might put her face on that pole and who knows whether she licks it. Any parents ever seen a kid drop a pacifier on the floor and then put it back in their mouth? Look, lady, America is a little afraid right now. 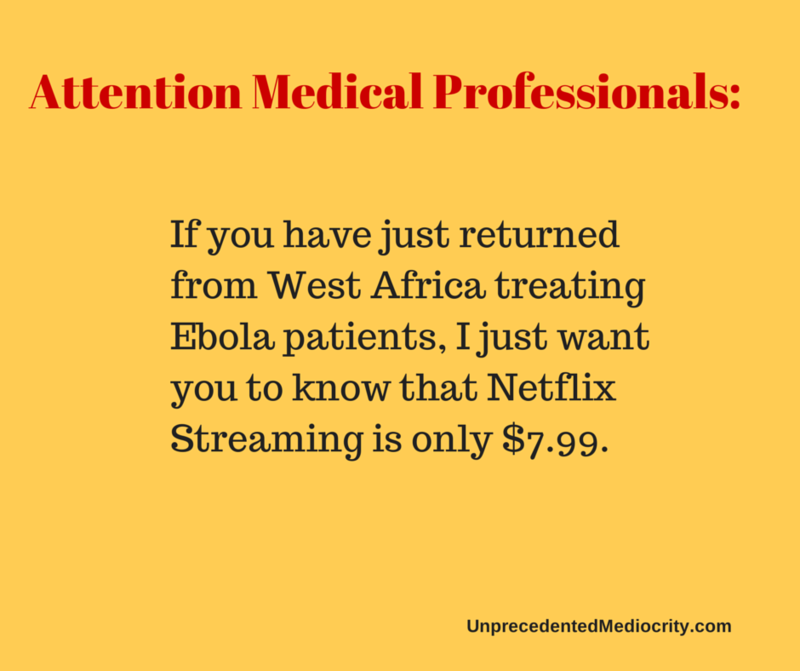 Not all of us are Scientist and the internet is flooding with Ebola misinformation right now. People are a little scared. Can you stay at home for 3 weeks and help us get past this initial phase of fear. I trust in the Science, I really do. But I also know that this nurse or anyone else can’t guarantee me freedom from their bodily fluids. Take a look at the picture below. I’ll pay for the Netflix subscription, I really will. I am glad they didn’t keep her in the E.T. style quarantine tent. That might be a bit much. But if this Nurse truly, in the face of all America’s fears right now, can’t stay at home and catch up on House of Cards for a few weeks, then that is just selfish. Incredibly Selfish. Be an example for America to calm our fears. Don’t grandstand about your rights. For I tell you this, if some 2 year old kid licks the doorknob you just touched after your first Ebola sneeze, then that is on you. You’re a Hero, Kaci. Act like it. I’ll order you Papa John’s tonight. Just tell me what toppings you like. I am not trying to invoke fear, but rather a calm and rational response. We have nothing to fear, that is until people give us something to fear. Help America invoke confidence in our ability to respond, not our ability to worry whether or not you are a spitter. Support commonsense by signing up for Unprecedented Mediocrity by email or like the Facebook Page Unprecedented Mediocrity. Good information to know, thanks! surely some take out pizza somewhere there, right? She really doesn’t look at the bigger picture here. If she does become symptomatic does she really think the hospitals in the county are going to be able to treat her? I’m glad her boyfriend couldn’t go another 3 weeks without being with her, instead putting himself at risk. These people are foolish. She if she didn’t want to be quarantined she should of stayed home to begin with. And as far as food in FK, you can’t leave out Al’s! Just for the record, we have no subway or Papa Johns in fort kent. In fact, I think the only places up there are locally named, owned and operated aside from maybe a McDonalds and Burger King. Good to know! I assumed Papa johns were everywehre. Surely there is take out pizza soemwhere right? Try the Mooseshack. They actually delivered a pizza to Kaci this week. We have a Subway and a Mcds in Fort Kent!! And a few pizza places. Just for the record, there is in fact a subway in Fort Kent. We do have a Subway! Ok ummm i live in fort kent. we have a subway and a McDonalds. No Burger king. Of course you have subway…. Wow, I’m glad I don’t live in Fort Kent… Not because it doesn’t have fast food, but it sounds like the entire town is in Quarantine. Yup, certainly feels that way today as it is snowing and snow days always feel like we’re quarantined. I had subway in fort Kent a few years ago. ??? Can’t we just re-draw the border around their house and then she can be Canada’s problem???!!!! Unique Solution Animal! Truthfully I have no idea where in Maine this is. You could literally throw a stone and hit Canada. It’s on the northern boarder of the US and Canada. Don’t sick her on Canada either–I have family & friends up there. do you relise there is an open border between fort kent and claire, and edmundston and madawaska? most people are related….just go up a little higher….st francois , i know people that half there lands are canadian and half americain….most of us are all related….i myself am canadians but have family across the border since my mom was an americain….so any problem for usa is a problem for canada….dugh!! when are you americains going to relize this and stop acting like where all eskimos here?? No thanks we don’t want her here in canada either. I am not paranoid about Ebola at all, but having said that she is an no hero for being willing to risk spreading it. I would happily stay quarantined just to be safe with something so often deadly. How will she feel if she does suddenly start showing symptoms and spreads it. Almost makes you hope she does have it just to show the government is simply trying to protect it’s people. Here we are talking about selfish Canada’s problem you started it you can damn we’ll keep it!!!!!!!! If you have a problem feel free to message me. Sorry I’ll correct my self you may have not started it but if it’s developed in your area it’s because of this ” selfish women” from America not canada so why attack us that comment is really stupied and nieve and selfish like we don’t have family or anything here we are just no hearted people.!!! Man I’m posing this comment on my wall because that’s how stupied it is and I really have to share with the world your stupiedy!! How about a free ticket back to West Africa? Fort Kent is pretty far north. When they say 3 hrs from Bangor, they are stretching it a bit, as I am 3 hrs from Bangor and FK is another hour plus North of me. If she does develop Ebola, this could be pretty devastating. Hospitals up here are barely equipped to handle day to day operations, let alone the procedure and isolation required to contain Ebola until she is transferred to GA or Nebraska. I shudder to think how things would go if she walked into TAMC while having ebola. Ft Kent is 3 hours from Bangor actually by way of Rte 11 South to Sherman where we have only an hour drive on I-95 to get there. So 3 hours is not stretching it at all. stupidity represents among a select number of medical professionals. She’ll never find employment as a RN for rebelling against the basics of what we live and work by. The science behind Ebola is not 100% clear and if our government applies rules to do no harm to Americans then EVERYONE should abide. I can see her being sanctioned followed by revocation of her license. I totally agree with the doc above. Her greed and stupidity is going to cost her big. I’ve been a GP for years now and I haven’t seen this much foolishness by any nurse. Her boyfriend is equally stupid. Both lack any commonse and intelligence. They don’t have Papa John’s up there…you might have to order from Moose Shack. But alas, someone aleady did send her some. The Netflix might be a good idea. On a more serious note, I’m originally from that area…grew up about 18 miles away. I have family and friends there. And I agree wholeheartedly…she is selfish. Moose Shack sounds tasty! that would work. I would simply ask; how many medical professionals, who are non-symptomatic, will it take to NOT develop Ebola before we give them the benefit of the doubt to be responsible adults and self monitor? Having a state trooper follow this nurse on a bike ride does nothing but add to the lunacy and misguided almost-panic of people in this country right now. In addition, it takes the focus off the issue of stopping the disease at its origin and will undoubtedly make it more difficult to convince qualified folks to travel abroad to help. Thanks all for the comments, keep them coming. Its a great conversation to have. Also, now I know where to eat if I ever visit this city in Maine! I gotta try this Rock’s then! Ok…so we should quarantine each & every professional after they have treated an ebola patient? Wouldn’t that eventually take a lot of professionals out of play. If she is asymptomatic, why quarantine? Simply to allieviate our fears, which by the way can be a bit irrational at times. What about HIV/ AIDS patients? Are we saying they should not be able to mix with the general public? After all, you can also contract that from the exchange of bodily fluids. She’s a professional. She knows the potential of harm to her own health & to others. I’m sure she is self-monitoring. By the way, I am a health care professional. We work with scary stuff every day. It’s what we do. It may be what YOU do every day, but that’s your choice. I DON’T choose to be around that—neither does most of the population. And based on her arrogance and defiant attitude, I doubt she’s doing anything helpful, i.e. monitoring ANYTHING other than thinking up new things to do to agitate the situation–like she’s done from Day 1 of all of this garbage. America is scared and unsure. They are trying to interpret truth from misinformation. Kaci could easily calm fears if she wanted as we come to terms with it. Instead, she shoves it down our throats and insists we take her word for it. quarantine at home for 21 days is not prison. she can lead on this, but she chooses not to. I keep seeing health care people commenting on this and I too am a nurse. Congrats on being in health care, but many (not all) healthcare people are horrible at taking proper actions to protect themselves or those they are caring for. You have not worked with this nurse and do not know her practices. How many people have you seen walking into a contact or droplet precaution room with no protection, if you say none your full of bs. Now these professionals are possibly bringing this home to their family and others they come into contact with. I think the 21 day quarantine is the proper action and if I was exposed, I would comply to protect my loved ones and my fellow citizens. This isn’t the flu virus that is only life threatening to the immuno compromised, it takes healthy individuals. By the time she realizes she is experiencing symptoms its too late now she has contaminated her home, boyfriend, the ambulance to pick her up, and many more areas. You know, this is really a big part of the problem. In America we look up to our health care workers. I, myself, have no doubt they are the greatest and best in the world. When you are the best at something, you are held to a higher standard than the average Joe. From little on, we are taught that doctors, and nurses, know best. We put our confidence in them with our lives and THIS is what we get? A whining crybaby. I really think its not just about ebola. I think it strikes at the very heart of what we once believed. Through a person like this we lose all trust in such a noble profession. We lose it on a massive scale. How would everyone in Fort kent like to be quarantined for 21 days? Also all the people that are so fast to judge this nurse,how about you all being quarantined? No problem I would happily be quarantined for a month if i had been exposed to it. My comfort is of little importance to the life of many. If I was a nurse or any other health care worker treating Ebola patients, I would gladly abide by the 21 day quarantine. I would NEVER want to risk transmitting this potentially fatal disease to anyone. I would not be able to live with myself if someone contracted Ebola because of my selfish act of not wanting to be quarantined. A entire battalion of soldiers are in quarantine. They just returned from west Africa, I don’t here them crying about it! But that’s because they put protecting American lives ahead of themselves. She is just loving her 15 minutes of fame! The CDC just deleted the following information from their transmission page. Why? It is not true anymore…. The press is asking and they are stonewalling. How does the CDC avoid a basic question such as why did you delete information from your website page. However, you can still see part of it on the google page. Although coughing and sneezing are not common symptoms of Ebola, if a symptomatic patient with Ebola coughs or sneezes on someone, and saliva or mucus come into contact with that person’s eyes, nose or mouth, these fluids may transmit the disease. But, now if you go to the CDC sheet, this information is gone. WHY IS THE CDC DELETING INFORMATION FROM THEIR OWN SITE? Well this is beyond stupid. So the articles main argument is – she doesn’t have ebola, but if she had, she could transmit it, so she must be put in quarantine? Or better yet, “people are afraid”, so she must be put in quarantine? What does public opinion has to do with refusing constitutional rights – you either are a threat or you are not, analysis has twice determined she doesn’t have ebola, means no quarantine and end of story. It can take 21 days to incubate. She is still a threat. Look at the doctor in New York. ..took almost 2 weeks for him! For a healthcare worker who was treating Ebola patients and then being unwilling to quarantine herself is appalling. I am also amazed at the stupidity of the sea of news reporters that swarmed around her when she and her boyfriend went out for a bike ride. Don’t they realize that they may be part of the problem? If she indeed does show symptoms of Ebola, they may have been exposed as well. Um, you ever been to Fort Kent? We DO have Subway! Is anyone here aware that the quarantined surgeon in California is actually permitted to leave his house to go jogging. When Kaci left her house she was swarmed by reporters in fort kent. Is the media immune to this disease? Haven’t we established she is a risk? The media is willing to put themselves at risk for…what. us? I think this article was sort of unoriginal. I keep seeing such negativity written about this nurse. The media should focus on educating the public on the latest science based policies and controlling panic. Shame on the media for escalating the publics fear. Kaci Hickox is under mandatory quarantine because America has already been fooled twice by medical professionals with so-called “asymtomatic ebola” rushing around violating their voluntary quarantines aka wedding dress Vinson & meatball Spencer! These people were asymptomatic….until they weren’t…. Then the CHAOS followed because guess what? Nobody could pinpoint the exact moment Ms Vinson & Dr Spencer went from asymptomatic to symtomatic. Was it 11:58 pm? 12:01 am? Nobody knows. Therefore Frontier Airlines had to spend thousands of dollars decontaminating their asymtomatic but possibly contaminated plane, New York had to spend thousands on retracing Spencers whereabouts & decontaminating subway cars! All of that could have been avoided had these asymtomatic ebola staff JUST STAYED HOME! Kaci is a grandstanding idiot! Thomas Duncan got exposed to Ebola and his first instinct was to leave Liberia and go to America to visit his family. Kaci Hickcox also exposed to Ebola and her first instinct is to fight tooth & nail against her quarantine so she can spend time with her boyfriend. Why? Wouldnt she want him safe instead? It doesnt make sense until you realize that human nature is to want to be close to love ones if you think you might not have much time left. Who knows if miss kaci has ebola but she is acting like someone who 21 days without her boyfriend is the worst punishment in the world.I think she protests too much….In fact, maybe she secretly is terrified she has ebola and wants to spend time with love ones before going to the hospital. Her actions are more like those from a desperate dying woman then a rational person would be. Fort Kent is our hometown, it’s NOT Kaci’s! Gov. LePage just got my vote! I’m not fear mongering, I just have common sense. You can be asystematic up to day 21. Just goes to show you that common sense, isn’t so common! Jeff, had Kaci not acted the way she has, believe me; food and entertainment would have been the last of her worries. We French open our doors and hearts to everyone, we just don’t cater to 15 minute fame +&%#@*! Come to Fort Kent & I’ll buy you the best poutine fries & hot dog in town, at Rocks then go for drink at Bee-Jays! Great perspective TruMainer. Glad to have that first hand account. I thInk the person who said fort Kent doesn’t have a subway meant the train, not the restaurant. As for the quarantine, she is absolutely selfish. It isn’t that long, and after the likely stressful job she had in west Africa, I would think she would like the tearfulness of such a break. 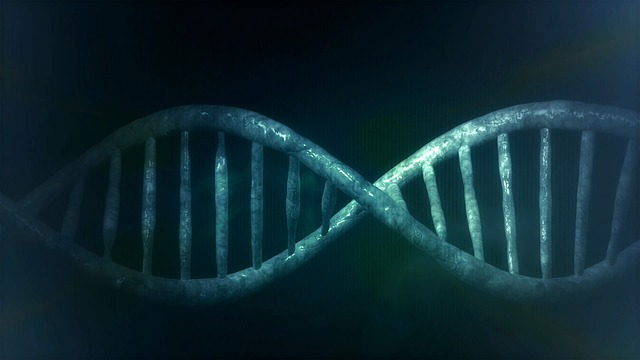 Listen to the doctors and virologists, not the politicians. The quarantine is pointless for someone who is asymptomatic. No virus shed before the fever. That is why the CDC recommends twice daily monitoring for fever and nothing else. I do trust the Science, I just haven’t seen anything that indicates they can know exactly when the last ebola free sneeze occurs and the first ebola contaminated sneeze begins? Just seems like a lot to risk right now. I agree that the rate of infection is low, but that means very little to the one person that catches it. But it has been a good conversation on here, so I appreciate the comments. The article was meant to be fun while making points at the same time.